Flow Meter and Flow Switch Model DS08 works according to a modified variable area principle. The float is guided in a cylindrical measuring tube by means of a spring. The flowing medium moves the float in the flow direction. An externally mounted pointer indicator is magnetically coupled to the float and thus, following the float position, indicates the flow rate on a scale. A Reed contact is mounted outside the meter in a sealed housing. When the float reaches the position of the Reed contact the switch will close. With higher flows the float moves further upward until it reaches a built-in float stop, still keeping the switch closed. This ensures a bistable switch function at any time. The Reed contact is adjustable over the full switching range of the meter. 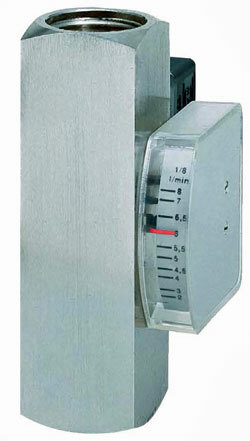 The built-in spring and the magnetic float guarantee an absolute reliability of the meter. This spring, which pushes the float back towards its zero position against the flow makes it possible to use the meter in any mounting position. The spring is artificially aged, thus eliminating the need for recalibration to the different mounting positions. The strong spring and an orifice in the float work together to limit the effects of viscosity changes to an absolute minimum compared to regular variable area flow meters.